Cross belt and bomb-bay “flat sorter” automated sortation systems revolutionize the sortation industry. Similar in operation to a tilt tray sorter, the cross belt and the bomb-bay sorter drops its contents at the desired sort location through a false bottom in the tray using gravity as the power source. 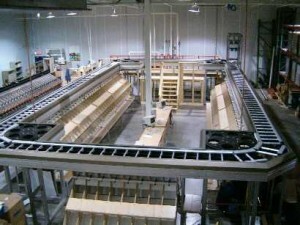 The flat sorter automated sortation system is unique because the sort trays are not connected to one another, and are moved through the system asynchronously on a conveyor instead of synchronously on a continuous chain. 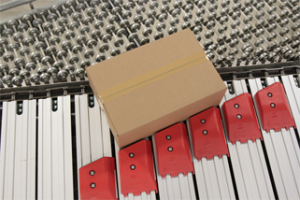 This difference provides several advantages over synchronous type warehouse sorting systems. 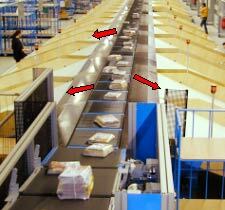 Shoe sorter systems are typically used in high rate carton warehouse sorting systems such as loading dock areas of large distribution centers Named after the sliding ‘pucks’ that guide loads off the main sorter, typically down conveyor lanes or chutes, these automated sortation systems are the fastest in their class.